The Marek Zidlicky era in Minnesota has come to an end as the veteran offensive-defenceman was shipped to the New Jersey Devils last night in exchange for Washington’s second round pick at the 2012 NHL Entry Draft, Nick Palmieri, Stephane Veilleux, d-man Kurtis Foster, and a conditional 3rd round draft pick in 2013. While Kurtis Foster played with the Wild from 2005-2009, the defenceman should not be the focal point of the trade as he sports a career -32 rating. For all intents and purposes, GM Chuck Fletcher made a move to ensure that his club would have some much needed depth if they are to make a push for the 8th and final playoff spot in the West. 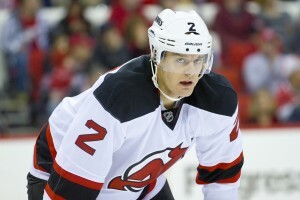 Marek Zidlicky was unhappy playing in Minnesota and his numbers (0 Goals, 14 Assists, -6) warranted a change of scenery. On the other hand, GM Lou Lamoriello also had to make a depth move and acquired a puck moving defenceman that can get shots on net and contribute to the Devil’s PP. Nick Palmieri’s time in New Jersey was likely finished when his entry-level deal expired after this season and the same argument could be made for Foster and Veilleux since they were in much the same boat. However, the hidden gem in this whole trade might be the second round 2012 pick that Minnesota acquired from New Jersey. Some might believe that the Devils overpaid for the services of Zidlicky, but the d-man could be a good fit in New Jersey. Foster had 4 points (2 Goals, 2 Assists) in the month of February for the Devils, but he couldn’t be counted on for consistent production, especially for a New Jersey team that wants to make a solid playoff run. Zidlicky provides the Devils with a true puck-moving defenceman and a veteran player that can help New Jersey in the playoffs if he can get shots on net and create rebound opportunities for his teammates. Nick Palmieri and Stephane Veilleux are not game changers by any stretch, but seeing as how the Wild have been ravaged by injuries this season, it is useful to have two forwards with NHL experience instead of constantly making call-ups from the AHL. While Kurtis Foster did not play under Mike Yeo in his previous stint with Minnesota, the d-man will be useful when Jared Spurgeon, Justin Falk, and Marco Scandella need to be spelled. Furthermore, all three acquired players will come off the Minnesota books come July 1st and the Wild will have an extra $4 Million of cap space to work with next season since the Devils will have to assume payment of the remainder of Zidlicky’s contract. When news of Marek Zidlicky’s trade broke, Minnesota Wild fans were probably thankful that GM Chuck Fletcher found a way to get rid of the disgruntled defenceman and the last year of his $4 Million contract. Zidlicky was starting to show signs of old age and it was probably time for the veteran d-man and the Wild to part ways after a 4 year relationship. Nobody will argue that it is beneficial to keep a player that isn’t happy playing for his team, but Zidlicky might just have something left in the tank after all. GM Lou Lamoriello has a brilliant hockey mind and would not make a deal that doesn’t help him out in some way, shape, or form. The Devils won’t be counting on Zidlicky for top defensive minutes and it would be foolish to think that Lamoriello would acquire the d-man for anything other than his offensive abilities (or what remains of them). Zidlicky won’t be a showstopper, but at 16-18 minutes a night he should be able to give the Devils exactly what they were looking for when they made this trade. On paper, the trade might seem like Minnesota got the upper hand as they received 3 players, a guaranteed second round selection in 2012, and a conditional 2013 third round pick if the Devils make it to the Eastern Conference Finals this year. While the long-term impact of this trade is yet to be seen, the Devils certainly addressed their needs by adding a puck moving d-man to their lineup. Marek Zidlicky wasn’t brought in to play defense for New Jersey and head coach Peter DeBoer is savvy enough to know where and when he could exploit Zidlicky’s talents. Any More “Wild” Trade Scenarios? General Manager Chuck Fletcher is probably done dealing as he has addressed the team’s need for depth players and might have Mikko Koivu coming back for Sunday’s contest against the San Jose Sharks. If he is able to, then Fletcher might try to unload another veteran d-man in the form of the prominent shot blocker Greg Zanon. Zanon might not have much left in the tank either, but he can be of use to any team looking for a bottom pair defenceman that can block shots. On the other hand, Josh Harding looks like he will be staying put at the deadline as the Wild sent Matt Hackett back to the Houston Aeros of the AHL. With a young group of talented players coming for tryouts in 2012, it is not surprising that the Wild have not hit the panic button and splurged on a prominent top-six forward. Jonas Brodin, Jason Zucker, Charlie Coyle, and Mikael Granlund will most likely give the Wild fans something to cheer about next season as the organization remains dedicated to improving from within.